As climate changes, dynamic coastal regions are experiencing a wide range of impacts. Sea levels, ocean acidification, sea surface temperatures, ocean heat, and ocean circulation have all been changing in ways unseen for thousands of years. Arctic sea ice melted significantly more during summers in the last 30 years, and storms are intensifying. Coastal ecosystems stand to be damaged, and coasts will likely erode from rising sea levels, intensified storm surges, and flooding that climate change may amplify. Coastal communities will need to prepare adaptation strategies to cope, and many who live or work in coastal regions are wondering what climate change might mean for them. This module provides an overview of the impacts coastal regions are experiencing and may continue to experience as a result of Earth’s changing climate. A video series within the module demonstrates effective strategies for communicating climate science. I thought the lesson was long. Maybe divide it into two different lessons. The questions on the quiz were not even mentioned in the lesson. Who ever made this class belongs in jail. The lesson was very informative but very lengthy. I think I'd it was broken up a little it would've been easier to study and take in the information. This is complex and far reaching material. It requires more than 2-3 hours of study and warrants 4-5 hours of pdh credit. The lesson was informative and definitely acquired great content, however the questions were difficult to process with the excessive amount of information provided. Putting out more simplicity within the content would change that factor and allow analyzation of the different topics to be more understandable. Warmer water contains less oxygen and is harmful to marine-ecosystems. Learners will be able to provide examples of oceanic and lacustrine evidence of climate change when communicating with stakeholders, community members, and peers. Learners will be able to provide examples of projected impacts from climate change to coastal environments. Learners will be able to list scientifically sound resources of coastal climate information, including key publications, documents, trusted experts, expert agencies, and websites, including the Sea Grant coastal climate wiki. Coastal extension agents will be able to list areas of current climate research. Learners will be able to describe effective community responses to coastal impacts associated with climate change, including sea level rise. 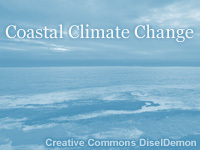 Learners will become adept at assessing projected coastal climate impacts for their unique regions. Learners will gain experience in working with scientists to translate complex climate graphics. The learner will be able to explain how climate models make climate forecasts, how downscaling is performed, and how regional modeling differs from global models.